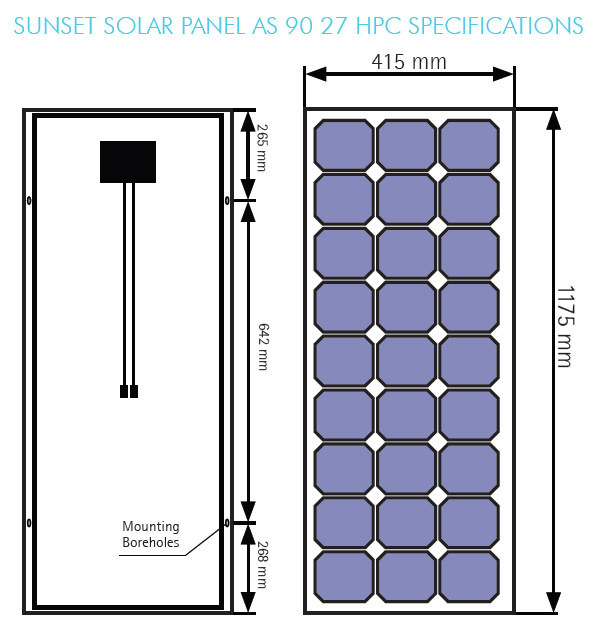 The solar generator AS 90 27 HPC consists of high powered monocrystalline 5 inch cells (HPC), made of SUNsilicon ®. The cells distinguish themselves by particularly high electricity output, even on cloudy days. The tried and tested module design protects the solar cells against moisture, gives UV stability, and allows for thermal expansion. The front covering is made of top quality tempered solar glazing. The solar glazing and the solar cell laminate are joined together into a unit and mounted in a torsion resistant frame, made of anodized aluminium. The solar modules of the AS HPC family are well protected from mechanical and climatic influences. The connection is housed in a weatherproof wiring box at the back in which also the bypass diodes are mounted. Due to their high efficiency the solar generators AS HPC are mainly used in solar arrangements like tracking systems or roof top installations. 5 year warranty covering failure and a 10 year warranty against the power produced by the solar panel reducing, from that produced when the panels were new.